Learn to understand, and speak Lithuanian. his is a charming old textbook, still my favorite despite its age. For one thing, it does not sacrifice traditional Lithuanian values on the "altar of modernity." You'll find it online at Amazon booksellers, along with more illustrations and sample pages. At times I have seen it available used for around eight dollars. Since there were no sound recordings available, I decided to make these with a digital recorder and the generous help of two Lithuanian students. Every lesson and extra reading, and most of the grammar examples: about five hours total time- all indexed and interactive. Find the sound track you need instantly. Access to the recordings is through a simple browser interface making navigation quicker and more accurate than traditional tape cassettes: no more frustrating spooling back and forth. Just click on the page where you are working, and you are there instantly! Take a look at this illustration. Do you want to get going with Lithuanian right now? Then do the download. You get 5 hours listening compressed to 48MB. In a moment you'll be on your way learning this fascinating language! Need more information? Then please send me an e-mail! 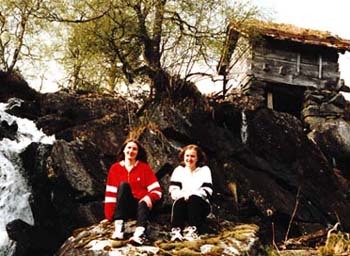 By an old watermill in north-western Norway.